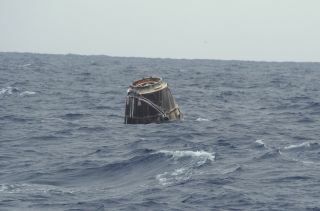 SpaceX's first Dragon capsule to visit the International Space Station bobs in the Pacific Ocean after a successful splashdown that capped its successful test flight on May 31, 2012. The capsule landed off the coast of Baja California. WASHINGTON — A key congressional critic of NASA’s commercial crew acquisition strategy has backed away from his insistence that the agency truncate the ongoing competition and proceed immediately with the selection of a single contractor. Rep. Frank Wolf (R-Va.) announced June 5 that he had reached a deal with NASA Administrator Charles Bolden that clears the agency to sign funded Space Act Agreements this summer with multiple companies developing privately operated crew transportation systems for the International Space Station (ISS). As chairman of the House appropriations subcommittee that funds NASA, Wolf authored a spending measure calling for the agency to immediately narrow the field of commercial crew competitors, either by picking a single provider now or adopting a so-called leader-follower strategy where the bulk of the money goes to the most promising company. The spending measure — the 2013 Commerce, Justice, Science Appropriations bill (H.R. 5326) approved May 10 in the House — also rejected NASA’s request for $830 million for the Commercial Crew Program, providing just $500 million for a condensed effort. Companion legislation now before the Senate would provide $525 million for commercial crew. NASA will award Space Act Agreements "to no more than 2.5 program partners (i.e., two full awards and one partial award), with the final number of awards made representing the minimum necessary to ensure the successful achievement of the [Commercial Crew Program’s] primary objective." The upcoming CCiCap awards — which NASA has said will fund a 21-month effort to take the competing concepts through critical design review — will be "the final phase of general development funding" for commercial crew contenders. Any follow-on money will be provided only for Federal Acquisition Regulation-type certification and service contracts. Bolden, in a June 4 letter to Wolf, confirmed those and other points and made an appeal for more commercial crew money. "I would emphasize that it is very important that the final FY2013 funding for the [Commercial Crew Program] be as robust as possible," Bolden said. He said a final appropriation closer to the president’s request is "highly desirable, in that it will increase NASA’s ability to deliver the safe and effective program we both wish to see accomplished." Bolden added that even more funding will be required in later years to effectively carry out the commercial crew plan. U.S. Sen. Kay Bailey Hutchison of Texas — the top Republican on the Senate Commerce, Science and Transportation Committee and the Senate Appropriations commerce, justice, science subcommittee — applauded NASA’s agreement to limit the number of companies that would continue to receive development funding for competing crew transport systems. "I had previously called for NASA to down-select from four potential providers to the top two firms," Hutchison said in a press release. "Today’s announcement follows that prescription and is welcome news." Rep. Dana Rohrabacher (R-Calif.), one of the more outspoken commercial crew advocates in the House, issued a statement praising the compromise. "I am pleased that [Commercial, Justice, Science] Appropriations Chairman Frank Wolf and NASA Administrator Bolden were able to come to an agreement ensuring that the Commercial Crew Program will move forward quickly while preserving competition in the program," Rohrabacher said. "This leadership will help bring about safe, reliable, domestic access to space for our astronauts on commercial vehicles, saving money, creating jobs in America, and leveraging our greatest strengths to maintain our international leadership in space."